This item is selling for $21.99 on eBay. Microphones are one of the most integral, yet often overlooked, aspects of creating professional grade recordings. Why spend thousands of dollars on fancy recording equipment only to purchase a low quality amateur mic? With Technical Pro, you won’t have to spend big bucks to get big sound. The MCZ PACK comes with 6 expert crafted mics, all for less than those other guys charge for just one. 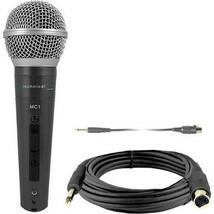 We have created the MCZ mics with a wired configuration for ideal sound quality and reliability. No need for batteries or worry of sound distortion from wireless transfer and frequency conversion. The included, six free extra long 10’ cables makes them great for multipurpose applications. You can use these for everything from studio recordings and live performances to public speaking and business presentations. The sturdy, padded aluminum carry case protects your microphones during transport or in case of any accidental drops. Your mics will stay in pristine conditions for years! A super low 600 ohm impedance ensures pitch perfect sound transfer over even the longest cables. Hooking up 30’ or longer cables when needed won’t be an issue. All of the included microphones have a Cardioid recording pattern making them great for vocal applications or areas where a lot of environmental noise is expected. No matter whether you are an amateur band setting up in your mom’s garage or a professional sound engineer, you’ll love the recordings made on your brand new MCZ microphones. Durable, impact resistant aluminum case. Sensitivity: -77dB ±3dB, Frequency Range: 42Hz-17KHz, 600 ohm impedance. Includes 2 free 10 ft XLR to 1/4'' cable great for multipurpose applications. Unidirectional polar pattern perfect for vocals.